When organizations implement an Enterprise Resource Planning system, they fail to recognize one main aspect of implementation that is ‘ERP training’, until the very last minute resulting in a disaster. ERP training is an integral part of ERP implementation and should be given high priority as training should begin even before it is implemented and continue after the implementation is complete. It’s not easy to conduct ERP training for end-users as there are several processes in place and each process is unique. There is no single route to conduct ERP training for software’s such as SAP, Planview, ServiceNow or Ariba. Classroom sessions are long and tedious and employees cannot afford to spend so much time in a classroom. Online learning is the best way to implement ERP training in today’s scenario. We’d like to share our four best practices that will help you implement ERP training in your organization. ERP systems have several roles and each role is different based on the users. If you look at procurement enterprise software systems such as SAP and Ariba, you have a role or user that raises an order and another role or user who approves the order. There cannot be a single content that demonstrates the functions of both roles; hence the best resort is to opt for role-based training where each role is treated exclusively. 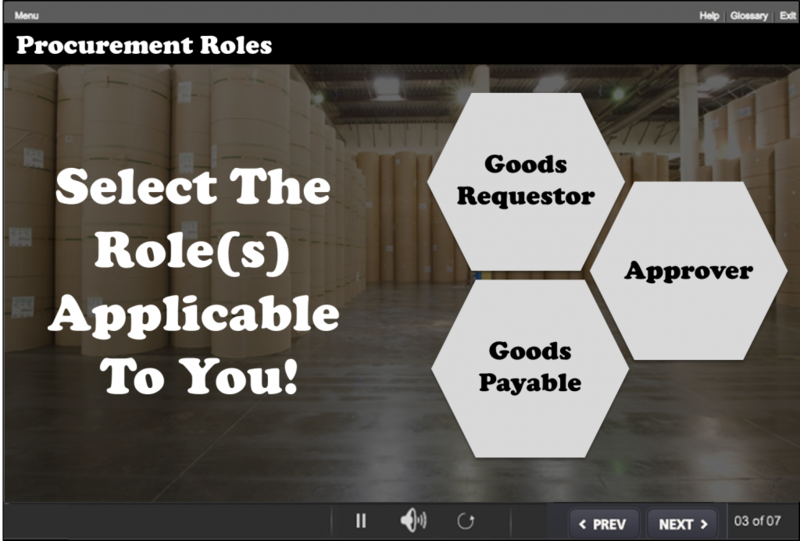 Take a look at the example below where the procurement process has been divided by its roles and the end-user only needs to select the role(s) applicable to him in order to learn about the software. All your end user needs to do is click on his role and the corresponding course of screens appears. This type of role-based learning eliminates the problem of going through all the offerings of the software. ERP training as a training subject can be long and monotonous, it is important to use the organization’s specific terminology to connect the course with the end-users. There will be plenty of instances where employees come across a challenge while working that will resonate with all the end-users. Creating and relating stores/scenarios, be in classroom or online training, related to the application as well as the end-user will strike a chord while learning. 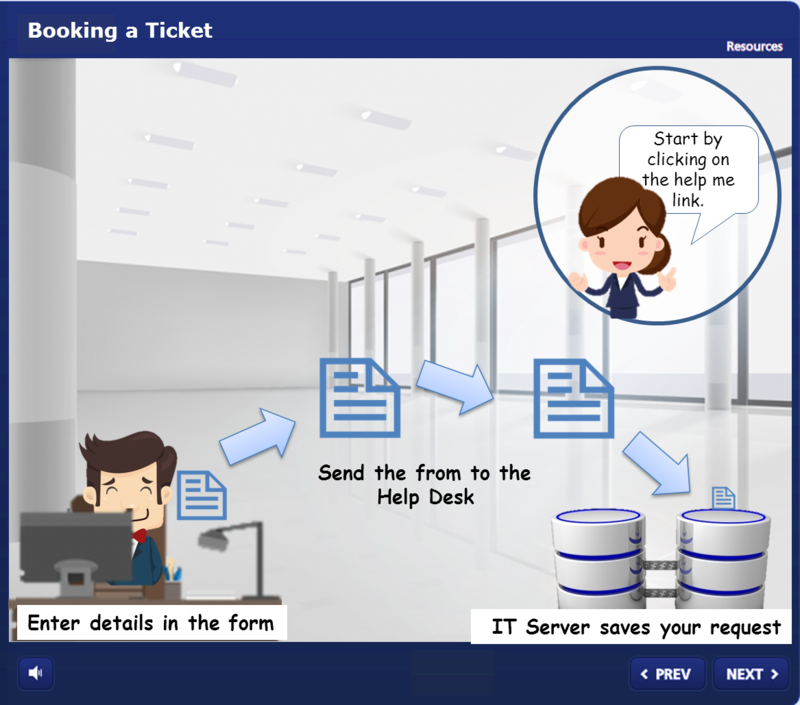 For instance, you can start by creating a scenario like in the screens shown below where a trainee needs help raising a ticket and the software expert guides him on the steps of raising a ticket. Using such real and problem solving scenarios will make the course content and context more relevant to the learner. Going green is the trend of the day and what better way to go green than e-learning! Every enterprise training program is flocked by paperwork such as user guides, PowerPoint presentations with screenshots that try to emulate step-by-step actions of the software. When it comes to e-learning, your user guides and PowerPoint presentations are brought together to create a real world simulation of the tool. This helps show accurate functions of the software and any additional ‘nice-to-know’ information can be handed down as a job aid PDF resource. Take a look at the example below of where information was added as a downloadable PDF. Nothing spells disaster like making a mistake in the enterprise software, one small mistake could take months to rectify, given the steps and processes involved. Organizations only show end-users how to use the software, there is almost little or no chance for them to try out the software to get acquainted with the tool. In such a scenario, it is best to opt for hands on training with the ‘Watch-Try-Do’ methodology. You can start out by showing the end-user how to use the software and then move on to letting him try it out in a fail-safe environment through a try simulation where mistakes have no consequences. Check out the screens below to see how a fail-safe environment was created. Training for ERP software is as important as implementing it. Keep these four practices in mind and sail through your ERP end-user training. If you have any more suggestions on ERP training, let us know your thoughts.